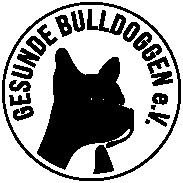 Blue Bulldogs - gesunde-bulldoggen-coms Webseite! Is it time to recognize the colour? 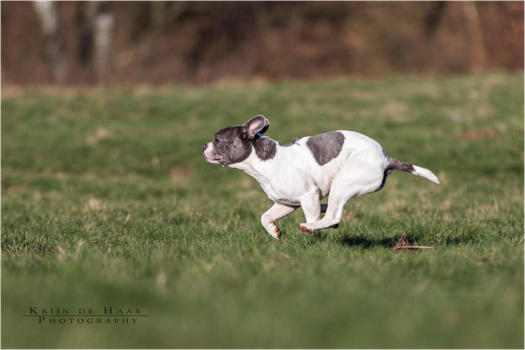 The following colours in French Bulldogs fall under FCI-standard colours: brindle, pied and fawn, and any variation thereof. In recent years breeding for the so-called unrecognized colors, that are not called for by the standard, has grown explosively. 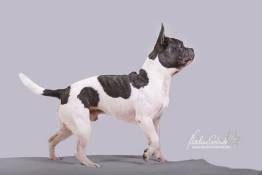 Independent for personal taste one has to recognize that there are French Bulldog breeders who breed these colors that keep high standards for the breed type and health. 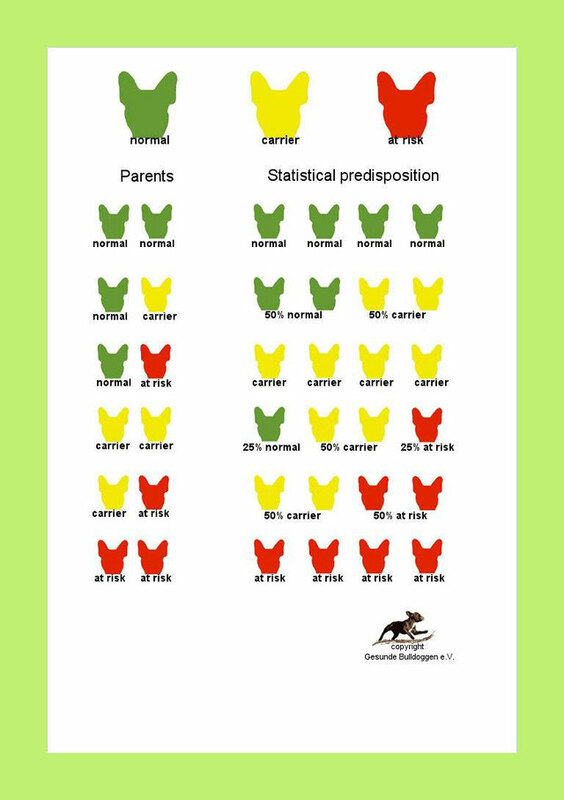 Even if some colour might be the result of an outcross many generations before, (which for the health of the breed would not be a disadvantage) these crosses are now so far back in pedigrees that most lines can be considered ‘purebred’ again. The only colors that might have relevance to health are the colors obtained through the dilute gene and Merle. The dilute gene, also called Blue, can bring serious skin issues in Dobermann und Pinscher breeds. This is why dilute is forbidden in those breeds. Other breeds, like the Weimaraner und the Great Dane, are free from those issues (called CDA-Colour Dilution Alopecia) and the colour is described and wanted in the breed standard. In French Bulldogs any clear proof of the possibility to CDA has not been provided so far, There are rumors here and there of known cases, but we are not yet aware of any scientifically proven case. Therefore we can assume that CDA is not (yet?) 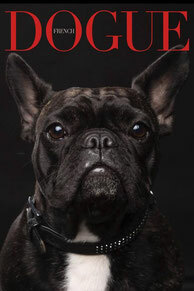 a topic of relevance in French Bulldogs. What does that mean for breeding? Up until now we have forbidden diluted dogs (d/d) of being bred. Only breeding with carriers (D/d) to clear (D/D) dogs. In such breeding there will also be carriers, statistically. The whole litter would be DNA-tested and the results will be added on the pedigree. In order to increase the genetic variety we recently have allowed that the mating with diluted dogs (d/d) to clear (D/D) dogs. There will be only carriers (D/d) in these litters who would not fall ill from presumed CDA under any circumstances. The big fear has always been that when these carrier animals fall in the ‘wrong’ hands they can be bred for diluted offsping. However, there is still no evidence yet provided for any occurrence of CDA within the breed. Furthermore with several other diseases that can be detected by genetic testing there is the same risk of misuse of the dogs. For example Degenerative Myelopathy, likewise to skeletal diseases and many more. What to do? Be stubborn about the standard colors and throw away generations of excellent evaluated dogs? Or give breeders their own responsibility and the opportunity to use new breeding lines? We have decided to continue to decline dilute and merle dogs. In some cases D/D and d/d combinations are accepted and dilution status will be noted in the pedigree of the puppies.